Eden Harper maximises the exposure of every property we offer for sale or rent in Brixton and Battersea by listing their details on both Zoopla and Rightmove – the two most viewed property websites in the UK. But while online property search sites enable buyers and tenants from anywhere in the world to see every last detail of your home when it is listed for sale or rent with Eden Harper, one of our most effective marketing tools can simply be For Sale and To Let boards. The media is fond of highlighting the fact that overseas investors are keen to snap up property in exclusive areas of London. A recent report revealed that oil royals from Qatar now own £1bn of property in Mayfair. It pointed out that almost a quarter of Mayfair’s 279 acres and over 4300 residential properties are now owned by Qatari investors, making the Gulf state the largest buyer and tenant group for luxury property in that part of London. While Eden Harper acknowledges that Battersea and Brixton also attract international buyers, the majority of property purchasers in our local areas already live nearby. And they often identify property to buy or rent from Eden Harper’s For Sale and To Let boards. The traditional house hunting method of visiting an area and noting individual properties displayed as available is still relevant today. When they see a property in Brixton or Battersea with one of Eden Harper’s boards outside, they ring us to request more details and we can add them to our database so they can be fully updated on further properties as soon as we’re instructed. For Sale boards can also prompt local residents into moving home. We’ve had many experiences of buyers who only viewed a property because it had a For Sale board outside. These type of home movers do not look at the property section of local newspapers or use the internet to find a suitable home because they had not previously considered moving. And the best thing for sellers is if a viewer wants to look inside a property after being alerted to its availability by a For Sale board, the chances are they will have already decided that they like the outside and the local area. Despite their clear advantages, For Sale boards are not universally popular. 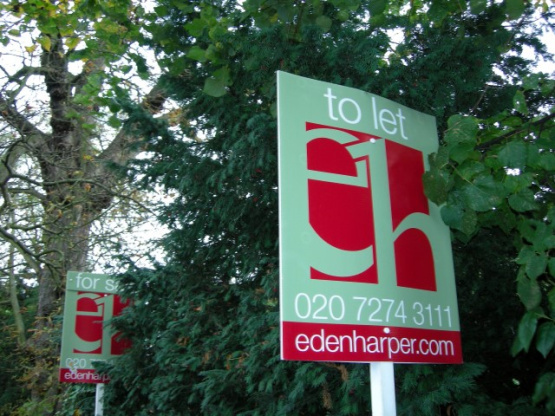 When the housing market slows down, or an estate agent over-values a home for sale, it can take longer than the current 11-15 weeks to complete a property sale in Brixton and Battersea after it has been listed with Eden Harper. In years gone by, this has led to a large number of For Sale boards remaining on display for long periods of time. A number of local planning authorities in London – including Hammersmith & Fulham and Kensington & Chelsea – have used the T&C Planning (Control of Advertisements) England Regulations 2007 to apply to the Secretary of State for a direction removing the rights of estate and letting agents to put up boards in a defined area, normally part of a conservation area. They can do this on the grounds that estate agents’ boards are damaging the character and appearance of a conservation area. Whether you approve of For Sale boards or not, there is no denying they help sell property by promoting it to a local audience. If you are putting your Brixton or Battersea home on the market with Eden Harper, a For Sale board will help generate the maximum number of enquiries, viewings and offers. But the key to receiving the highest offer from the marketplace is to select the agent who will gain the widest possible exposure using every means available. To find out how much your home is worth, contact Eden Harper’s valuations teamtoday.